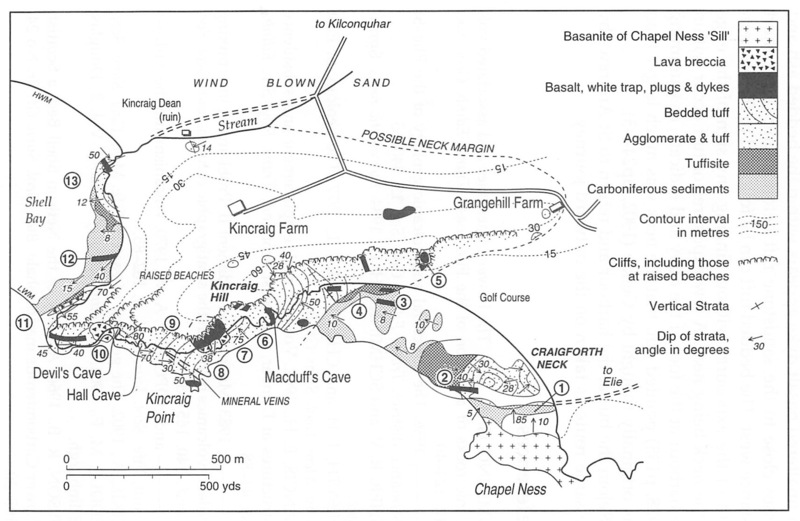 Map 20 Kincraig–Chapel Ness, Elie. Figure 14 Kincraig Neck, Elie, seen from the golf course. Notice the well bedded tuff dipping towards Centre 1 within the neck. The dark distant cliff is columnar-jointed basalt, also within the neck. Figure 15 The raised beaches on Kincraig Hill, Elie seen from Shell Bay. These lie at about 4, 11.5, 22 and 24.5 m OD and mark stages of stillstand during isostatic uplift of the area following deglaciation. Plate 6 Columnar-jointed basalt in the main plug, Kincraig Neck, Elie. The wave-cut platform in the foreground truncates bedded tuff dipping towards Centre 2 within the neck. Excursion 15, Location 8. (Geological Survey Photo, Crown Copyright Reserved). Walking distance 3 km of track and sandy beach; 0.8 km of arduous rock scrambling – see warning below. Purpose The main purpose of the excursion is to examine an exceptionally well exposed Carboniferous volcanic neck, Kincraig Neck, which is exposed amid fine coastal cliff scenery west of Elie on the Firth of Forth. Within it the relationships of plugs, dykes and tuff to each other and to the country rock can clearly be seen in the cliffs and in the wavecut platform. 1. Access to the shore between Localities 6 and 10 is restricted by the tide to 2.5 hours on either side of low tide. 2. Since the route round the foot of the cliff involves several climbs and descents by means of chains and footholds cut in the rock, those less certain of their footing are recommended to follow the good cliff-top path from Locality 5 to beyond Locality 10 where they may rejoin the shore route. Route Follow A915 south from St Andrews to Largoward, then B941 through Kilconquhar to join A917 1.5 km north of Elie; follow A917 into the town as far as the parish church and turn right at the T-junction. Now travel westwards through Earlsferry for 1 km to a car park beside the golf course, where the bus should remain. From here the excursion should be followed to Locality 10 before returning along the cliff-top path which gives an excellent 'aerial' view of the exposures. Alternatively, if more time is available, follow the excursion to Locality 13 before either returning or arranging to be picked up at the Shell Bay Caravan Site. Follow the track westwards across the golf course for 0.5 km to the shore at the margin of the Craigforth Neck lying southeast of the main Kincraig Neck. One hundred and forty metres south-west lies the Chapel Ness Basanite Intrusion. It forms a step-like feature across the beach and displays well developed columnar jointing. The rock, which is very fine grained, is grey when fresh, but takes on a faint purple hue on weathering. It is amygdaloidal towards the base and also contains a 1.5 m thick dyke displaying good horizontal columns. The underlying sediments are gently dipping and are separated from the intrusion by an extensive breccia zone containing large rafts of country rock in a matrix of disrupted sediment. A careful examination of these rocks will show that white trap veins from the base of the intrusion extend into the breccia zone and the country rocks. Tuff and agglomerate crop out low on the shore and are separated from the intrusion by the breccia zone. These features are more reminiscent of a neck intrusion. On its eastern side the intrusion is sill like, being generally in concordance with the sediments of the Limestone Coal Formation. Forsyth and Chisholm (1977, p. 188) suggest that it is indeed a neck intrusion, but one which extends from the neck into the sediments as a sill on the eastern side. One hundred and forty metres to the north of the intrusion the gently dipping country rock is bent down steeply (up to 85°) into the margin of the Craigforth Neck. Here the country rock is hardened, thus standing up above the surrounding rocks, and is cut by many calcite veins. Notice that the neck, which here contains unbedded, very shaly tuff, is also cut by many calcite veins for the first few metres inwards from the margin. On passing north-westwards across the shore, well bedded tuff is reached and in this it is possible to make out concentric dips associated with at least three separate centres within 140 m of the neck margin. A 6 m thick basalt dyke is well exposed low on the shore. North-west from the bedded tuff centres there is an outcrop of little disturbed sandy beds striking approximately E–W, apparently lying within the neck and dipping parallel to the tuff. The remainder of the neck is occupied by tuffisite composed mainly of sediment, apparently broken up in place by gas action with beds of sediment (up to 20 cm thick) still in place. The western margin of this tuffisite is steeply inward dipping and similar to the margin on the south side of the vent. For the next 275 m along the shore to the WNW, sandstone ridges dipping west at 8°–10° protrude from the sand. 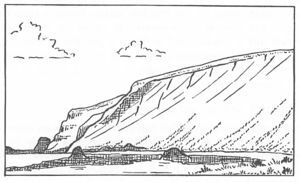 At one of these ridges, lying 27 m from the margin of the Kincraig Neck, examine carefully an E–W basalt dyke, now altered to white trap at its margins, especially where it divides to form thin stringers running into the country rock. Where the dyke is about 3 m thick, the centre is little altered. Calcite veins in the white trap run parallel to the length of the dyke. At this locality note that the south-eastern side of the neck has a sheath of marginal intrusion breccia or tuffisite which, although at least 25 m wide at the top of the beach, tapers to only a few metres at LWM. There is little sign of forcible displacement of the country rock, rather the beds are simply truncated by the intrusion breccia with slight bending into the neck for a few metres only. Examine the intrusion breccia which consists mainly of fairly small fragments of shaly material cut by sporadic, highly irregular white trap masses. It contains blocks up to several metres across of both sandstone and shale. The large blocks are well exposed at the top of the beach north of the white trap dyke at Location 3. Isolated fragments of white trap, only a few centimetres across, also occur in the shaly matrix. Intrusion breccia of this type is generally believed to be emplaced at an early stage in the formation of the Fife necks, but this is apparently not always the case; here the breccia invades not only the country rock, but also the bedded ash within the neck. On passing north across the intrusion breccia, dull grey-green bedded tuff is encountered and the bedding within this is splendidly displayed in the cliffs of Kincraig Hill 75 m further west. On the shore, steeply dipping tuff is broken by faults every few tens of metres with changes of strike across the faults. Notice that the tuff varies in grain size from fine volcanic dust to lava fragments centimetres across with larger lava fragments scattered throughout. Pieces of older bedded tuff and sediment are not common. This tuff is invaded by small tuffisite dykes and also by small basalt masses, one far down the shore and only accessible at low tide, another forming the crag at Location 5. The bedding in the tuff becomes indistinct in places (and may disappear either gradually or abruptly, as at faults), but where it can be traced for any distance, it dips towards a series of centres though nowhere is a complete circle round such a centre seen. Four centres can be recognised in the Kincraig Neck, though the tuffs associated with them occupy less than half the known area of the neck. The first of these lies approximately 75 m west of MacDuff's Cave and the tuffs of Kincraig Hill dip towards it. This locality may be examined on the return to the bus along the cliff top path. A small basalt plug 15 m across forms a prominent crag 255 m north-east of Location 4 and on examination will be seen to consist of two small masses showing good columnar jointing. Stringers of basalt run out from it into the adjacent tuff, but there is little sign of alteration in the tuff. Veins of calcite are widespread within the plug. At the gully in the cliff called MacDuff's Cave, where the first chains occur on the shore path, note that the bedded tuff is cut by a fault along which an impersistent, up to 20 cm thick, basalt dyke has been emplaced. The dyke is found on the west side of the gully. Beyond the fault the dip is variable, but in general concentric about the same focus. After passing the prominent headland 75 m south-west of the cave, notice that the bedding becomes indistinct, though it can still be discerned high in the cliff. High on the cliff in the northern corner of the next bay, note three small irregular dykes cutting the tuff. The rocks on the shore here should be examined carefully. The bedded tuff dips at 75° to the NNW and contains irregular blocks of similar, older, bedded tuff up to 2 m across. This blocky tuff continues west, but becomes brecciated for the last few metres before the junction with the main plug is reached. The plug is in two parts, probably continuous, but divided by a grass covered gully, columnar jointing being well displayed in both parts. In the eastern part, individual columns are as much as 20 m long, sweeping unbroken up the cliff face. The inclination of the columns suggests that the lava which cooled to form them occupied a conical depression (Forsyth and Chisholm 1977, p. 186), presumably overlying the feeder pipe (cf. Whyte 1966, Fig.3, p. 111). Forsyth and Chisholm suggest, however, that it overlies a collapse breccia. The next chain at the western side of the bay allows one to pass a small headland of tuff (which may be skirted at low tide) abutting against the plug. Beyond it is a wide wave cut platform in bedded tuff, which although similar to that seen further east, dips to the south and south-east at 30°–50° and is therefore associated with a second centre. 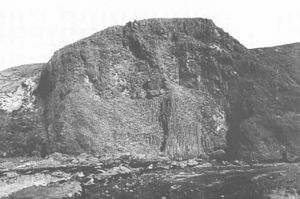 When this tuff is traced towards the western part of the plug, a new rock type is met: a breccia of lava blocks up to 60 cm across which forms an intermittent screen between the plug and the bedded tuff. A further small part of this screen occurs against the eastern part of the plug, but is largely obscured by fallen columns and other debris. At the top of the next chain, where the basalt is in contact with the bedded tuff, the columnar jointing gives way to a platy jointing some metres from the tuff (see Plate 6). When the contact between the lava breccia and the plug is examined at the base of the chain, it will be seen that tuff has been injected along the contact and thus provides evidence of a later phase of igneous activity. This tuff dyke, about 0.3 m wide, is purely local. Notice that the western plug has a break in its columnar jointing about halfway up (this is more clearly seen with the aid of binoculars) and it appears that at least two intrusions are represented in the visible part of the basalt mass (Geikie 1902, p. 12). That the lava breccia is later than the plug can be demonstrated by following their junction westwards round the edge of the plug and then for 15 m up a gully running part way up the cliff from the shore. In this gully the breccia can be seen to abut against the columns and several of these have been wedged loose so that they now lie in the breccia. Seams of tuff also penetrate between the columns which are essentially in their original positions. In the cliff beneath an old gun emplacement, about 25 m west of the plug margin, a mass of columns of lava measuring 1.5 x 0.9 m lies enclosed in the agglomerate, a clear indication of their age relationship. A late stage discharge of gas at the western margin of the plug appears to have broken up the columnar basalt, the gas penetrating between the columns and prizing some of these away from the main mass. To the west and south the same gas action has disrupted the bedded tuff and, for some metres west of the main plug, the outcrops consist of unbedded tuff or agglomerate in which lie broken up columns of basalt. On the wave cut platform the sea has, in several places, cut back along joints in the bedded tuff. A small E–W dyke is exposed on the shore platform at Kincraig Point, but dykes are generally rare on this part of the shore. Minor mineralisation is present in veins in the bedded tuff, small amounts of pyrite being present in a gangue composed of barytes, calcite and quartz (amethyst). 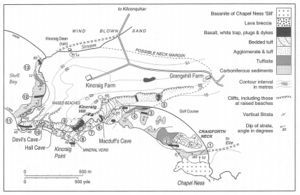 The bedded tuff of Kincraig contains nodules composed of mineral aggregates or single crystals; hornblendite, pyroxenite, biotite and olivine have all been recorded. The bedding of the tuff continues to dip towards Centre 2 for another 180 m west from the main plug. At the western end of the wave cut platform, it is necessary to use chains once more to reach Hall Cave and to continue west from it. Just east of Hall Cave the bedded tuff of Centre 2 is truncated at a gully by that of Centre 3 and thereafter the dips in the bedded tuff are about 80° south-west towards a centre lying about 90 m south-west of Devil's Cave. Notice that here too the tuff alternates between coarse- and fine-grained beds and contains large isolated blocks. On the western side of Devil's Cave a mass of lava breccia 60 m across may be examined. It is apparently plug-like, but has irregular non-vertical margins. A small number of very irregular basalt dykes cuts the eastern part of this mass and two more occur in the bedded tuff a few metres south of the breccia; none is more than lm across. Westwards, the lava breccia passes by gradation into unbedded tuff. In a small bay 35 m south-west of Devil's Cave lies a large block of pink augen-gneiss measuring 1.2 x 1.0 x 1.0 m and presumably an erratic block deposited by the Forth Glacier during the Devensian glaciation. West from here to the point at Shell Bay, the bedded tuff dips ESE at 40°–50°. It is cut by a 1 m thick dyke and associated calcite veins. At the headland 75 m southwest of the dyke, the bedded tuff contains examples of low angle cross bedding and graded bedding. These features may indicate a base surge deposit similar to that found at Elie Ness (Excursion 14, Location 8). Return to the bus along the cliff top or alternatively carry on to Locations 11, 12 and 13. Passing north-east and then north from the point at Shell Bay, the margin of Kincraig Neck is reached. Parallel to it is an area of coarse lava breccia, 10 x 135 m, presumably the product of a late centre of activity comparable to that at Devil's Cave. At the neck margin, which strikes NE–SW parallel to the coastline, is a hardened sandstone ridge which is succeeded inwards by tuffisite and then, locally, the lava breccia followed by the bedded tuff, now dipping to the south-east at 55°–75°. Just before the neck margin reaches HWM, the dip of the bedded tuff has changed to 70° to the south-west, thus continuing the swing in strike round Centre 3. Examine here sandstones and shales of the Limestone Coal Formation, lying on the western side of the neck, which have a general westerly inclination of 10°–12° modified by gentle flexuring. These sediments are cut by several tuffisite dykes and a white trap dyke. The margin of the Kincraig Neck reappears towards the northern end of Shell Bay. Striking NW–SE at first it swings round to N–S before disappearing under the sands of the bay. Along most of its length hereabouts, there is a sheath of tuffisite which in one place tongues south into the country rock for 25 m. As in previous occurrences the tuffisite consists of shaly and sandy blocks set in a shaly matrix with spots and streaks of white trap. The bedded tuff within the neck strikes parallel to the margin and dips at high angles throughout. When last seen at the mouth of the burn, the dip is to the south-east, i.e. towards Centre 4. In the same exposures the bedded tuff is cut by small, impersistent and twisting basalt dykes. In an isolated exposure south of Kincraig Dean the tuff dips almost due west at 14°, implying a further swing round the fourth centre. At the western end of Kincraig Hill are four very well preserved raised beaches of Late-glacial and Postglacial age. These can be clearly seen from Shell Bay. 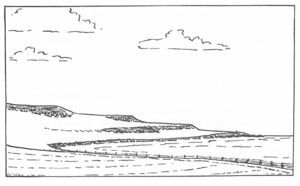 They are cut into the soft, easily eroded, bedded tuff at approximately 3.6 m, 11.5 m, 22 m and 24.5 m above sea level (Cullingford and Smith 1966, p. 40) and are analogous to the beach beneath them on the present day coastline, e.g. at Location 9. The origin of such beaches is discussed on pp 69–71. Elsewhere on Kincraig Hill there are few exposures, but in the remains of the army camp on top of the hill, bedded tuff, now deeply weathered, occurs in trenches and other excavations. Basalt with well developed columnar jointing outcrops in a rocky crag 450 m east of Kincraig Farm, presumably forming part of another plug. Scattered exposures of tuff continue eastwards as far as Grangehill Farm, but the location of the neck margin is unknown. Return along the cliff top path to the bus, or rejoin the bus at the caravan site. WHYTE, F., 1966. Dumbarton Rock. Scot. Jour. Geol., 2, 107–21. This page was last modified on 23 February 2019, at 14:22.